After Donald Trump’s Twitter threat to “devastate Turkey economically if they hit Kurds,” Ankara’s foreign minister, Mevlut Cavusoglu, responded that the US will not “get anywhere by threatening Turkey economically.” It was a brave statement in response to an undiplomatic threat from a NATO ally, but, unfortunately for Turkey, the past few months suggest otherwise. Last August, the US slapped tariffs on the country’s steel and aluminum exports, sending the Turkish lira plummeting. The tariffs were lifted after an American pastor whose cause the American president, Donald Trump, had championed was released from jail. But the Turkish economy is only now recovering, so Turkish politicians will be well aware that the threat is potent. Whether Trump’s threat is simple bullying (as it looks from the Turkish side of the Atlantic) or the legitimate use of economic pressure to change behavior (as Washington would characterize it) is a matter of debate. America’s economic power certainly gives it significant leverage. But Turkey has also made itself more vulnerable, by intertwining politics and economics too much. There are ways that Turkey could strengthen its economy against external interference. But so far, the Turkish president shows little interest in doing so. On the contrary, Recep Tayyip Erdogan has put most of his faith in political rather than economic defense. Turkey has two primary economic problems that make it vulnerable to outside interference. The first is high external debt: at the end of 2018, Turkey’s external debt amounted to more than 50 percent of its GDP. With most of this in dollars and euros, servicing the debt becomes more expensive as the value of the lira weakens. The second weakness is high inflation, which reached a peak of 25 percent in November, but has dropped slightly since. Both these issues depend on market sentiment, with the lira rising or falling depending on what financial markets think of what is happening to the economy. And what is happening to the economy depends on what happens with Turkey’s internal politics. This is where Erdogan comes in. Because the president has been vocally against high interest rates, which are necessary to curb inflation, in part on moral grounds and in part because they hurt his base. Many of Turkey’s middle-income households took advantage of cheap credit to improve their lifestyles, and big construction companies borrowed freely to create signature projects that have not proved profitable (or remain unfinished). High interest rates hurt both. And therein lies both the weakness of Turkey’s economy and its potential defense. By intertwining politics and economics so closely, movement in the first has an immediate impact on the second. If Turkey’s president gave up a bit of influence, he would end up with more power. The best way to erect an economic defense would be to firewall the economy from Erdogan’s policies, specifically by him giving up influence over the central bank. That would reassure the markets that the central bank would take decisions free of political considerations. But instead, Erdogan, in just the last two weeks, has moved to consolidate his influence over it. In mid-January, three days after Trump’s threat to devastate the economy, the central bank decided to leave interest rates unchanged. Even that was seen as a compromise against what markets wanted (an interest rate rise) and what Erdogan wanted (an interest rate cut ahead of municipal elections in March). The same day, however, parliament voted to give Erdogan emergency powers in the event of a “negative development” that could threaten the country’s financial stability. Coming so soon after Trump’s threat, it is hard to imagine the two were not linked. It is clear that Erdogan wants to create a line of economic defense in case of new threats – threats that will, if they come, almost certainly be the result of his foreign policy maneuver over Syria. Ironically, though, he would do better to create that line of defense by severing his own influence over the central bank, which would strengthen the economy and conversely give him more freedom to pursue his foreign policy. Instead, Erdogan has shown a preference for political defense, putting his faith in political deals and political threats. Certainly, deals have worked: the release of US pastor Andrew Brunson from house arrest in October brought the sanctions to an end. 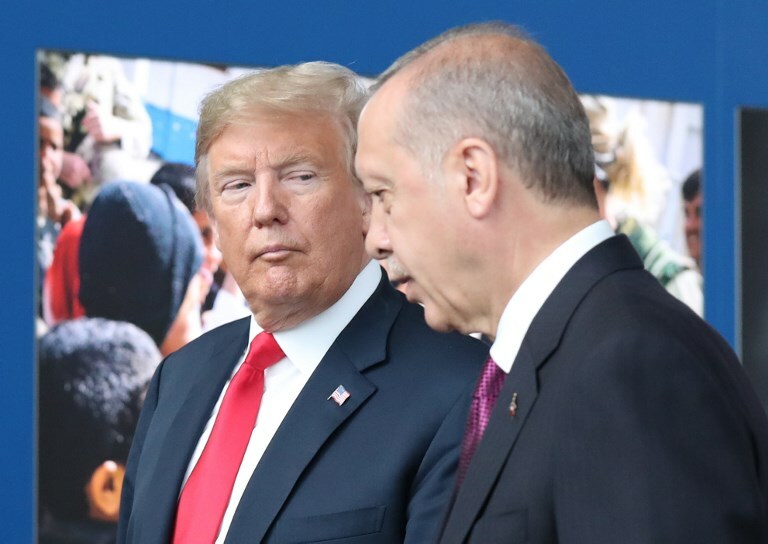 And the day after Trump tweeted his latest threat, Erdogan called and offered a safe zone in northern Syria, an offer that appears to have brought Trump back onside. Nor has Erdogan shied away from making political threats, warning that without a safe zone, there may be more Syrian migration to Europe. But pursuing his own art of the deal has left the economy as the country’s Achille’s hell. Erdogan is certainly a cunning tactician, but by refusing to give up influence over the central bank he has drastically reduced his ability to maneuver. Trump has threatened to hurt the Turkish economy if he doesn’t get his way. Ironically, Erdogan, by insisting on getting his way over the economy, is already accomplishing that.